I know how much our customers enjoy quinoa: It's super high in protein, gluten-free, and contains virtually no starches or carbs. So I came up with a recipe that truly makes quinoa delicious and exciting to enjoy. It's super-easy to make: it doesn’t take more than 30 minutes of your time. The result is a very filling, yet low-fat meal that your entire family will love! Read on and check out my delicious recipe! Soak the freeze-dried corn and peas for at least 30 minutes. Drain the water. In a small pot, bring quinoa and liquid to a boil, cover and simmer until tender and all the liquid has been absorbed (about 15-20 minutes). In a large skillet, heat the coconut oil to medium-low heat, add the onion, corn and peas. Cook until golden brown. Add the quinoa, stir to combine with the vegetable mixture. Add the soy sauce, salt and pepper. Click to see the video recipe! You can find almost all the ingredients at the Health Ranger Store, so you KNOW that everything you eat is CLEAN, pure, non-GMO and laboratory tested. Why should you incorporate The Health Ranger Select Organic Quinoa in your diet? Organic quinoa has been cultivated for thousands of years in the Andes. Organic quinoa is one of the most protein-rich foods known to man – it contains all the essential amino acids, making it a perfect food for vegans, vegetarians and meat-eaters alike. Our Organic Quinoa contains twice as much fiber as any other grain. The Health Ranger Select Organic Quinoa is brimming with manganese (has antioxidant properties) and riboflavin (vitamin B2). Health Ranger Select Organic Quinoa is sourced from verified growers in Peru. It's USDA organic certified, Kosher-certified, GMO-free and laboratory tested for heavy metals. It's super CLEAN and super nutritious. Demand is very high for clean food, so order now while we have inventory (which comes and goes, based on seasonality and availability). This grain is incredibly versatile and super-tasty. Use it to make your own recipes or try mine (see below). Health Ranger's Himalayan Salt – this ancient ocean salt delivers a wide array of trace minerals and is harvested from salt caves that were formed millions of years before humankind polluted the oceans. The Health Ranger's 100% Organic Ground Black Pepper is packed with manganese, iron, potassium, vitamin C, vitamin K, and dietary fiber. Plus, it contains piperine, a potent phytonutrient known to help boost absorption of certain nutrients. The Health Ranger's Organic Freeze-Dried Corn is brimming with antioxidants, dietary fiber and vitamin B. Always non-GMO and grown without the use of synthetic chemicals of any kind. The Health Ranger's Organic Freeze-Dried Peas are a great source of vitamin K, manganese, dietary fiber, vitamin B1, copper, vitamin C, phosphorus, folate and many other minerals and nutrients. The Health Ranger Select Organic Extra Virgin Coconut Oil contains healthy plant-based fatty acids and MCTs. Improve your nutrition – get lab-validated foods! Try this recipe and you'll find it amazing! Quinoa can be made exciting and nutritious, and it also stores well for a long-term preparedness / survival food. It rehydrates easily and can be made into dozens of cutting edge recipes for children, adults, vegans, meat eaters and everyone! Take advantage of our inventory while we have it... quinoa goes out of stock frequently and it's difficult for us to find clean sources that meet our laboratory analysis specifications. Limited supply of Organic Quinoa – buy now! Get clean organic quinoa NOW! If you still don’t believe that food can be both healthy and delicious, then you probably haven’t tried this recipe yet! 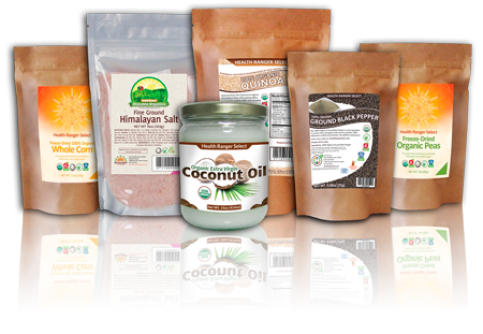 Get all the clean, pure and non-GMO ingredients you need from the Health Ranger Store and start cooking. You’ll be done in no time and your entire family will love this new dish!